A group of new day traders was told that many of them would make $1,000, or even $5,000, relatively easily but then they would lose it. This cycle would repeat indefinitely. Despite being able to make $1,000 or $5,000 (depending on starting account size) over and over again, most day traders end up being like a recreational fisherman: catching a fish but then throwing it back. Professionals, on the other hand, make $1,000 and then make another $1,000, and another, drawing an income from their trading or growing their account. 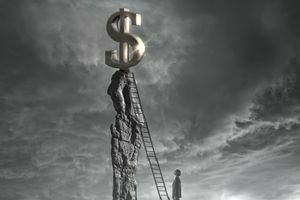 If you want to go from making $1,000 and losing it, to making $1,000, keeping it and making another $1,000 (the $100,000 trader) here are the common pitfalls to overcome. Note: the numbers aren't important, the distinction is between going from inconsistent to consistent. As a trader, your goal is to focus on the task at hand, and not get caught up in thinking about how big your account is or isn't. In trading your purpose is to execute the entry exactly as practiced, place your stop loss where it is supposed to be and adjust it accordingly (if needed) and take profit when your trading plan dictates. As soon as you start thinking about money, your emotions get involved, you take profits too early, or losses to late, you may avoid valid trades or take trades which aren't valid. Your focus has shifted away from the only thing that can consistently make you money—following your plan. The following problems are all related to being focused on the wrong thing but may disguise themselves in other ways. Traders lose focus because they get stuck in a short-sighted mode. Say you want to get in shape so you start going to the gym. You go for a few days, but don't notice any results. You're sore, but you don't look any better. So you stop going—you're not seeing the results you want. A few months go by and you do the same thing, then quit. This repeats until you give up altogether or eliminate your short-sighted thinking. When your focus is on immediate trading results (not process) you'll continually lose whatever money you make. If you start trading to make some quick cash and do, you're still in trouble. As discussed above your focus is still on the wrong thing. Whether it's the gym or the markets, your focus needs to be on implementing and managing your plan on every single trade, every day. If you do the right thing (follow your trading plan and make it your sole purpose to execute that plan flawlessly), your long-term goals take themselves. It takes less than 5 seconds of actual physical activity to open and manage a trade (set orders, and adjust them if needed). Make five trades in a two hour period, and you have spent probably about 25 seconds doing "actual work." The rest of the time you're tinkering around or thinking. That's almost 7200 seconds where you aren't trading but have the opportunity to mess up if you're not focused (and that's only for a two hour period; trade all day and you have loads of seconds of where a slight lapse in focus can ruin a trading day). This is why we recommend day traders only trade for about one to two hours at a time; holding focus for two hours is hard enough. Try to do it all day and you'll start making mistakes. Thinking is good while trading, but it should be laser-focused on how you will implement your plan under current market conditions. If you start thinking about how much money you are up or down, that car you want to buy, overdue bills, your losing day yesterday, or the insane winning streak you're on, you're already off track. It doesn't mean you'll lose your next trade—the market can produce lots of random winners—but you are in a state, where you're more likely to give the money back. Nearly all psychological trading issues can be handled by removing other thoughts except for implementing the plan. Make no mistake, this is also very difficult to do. The mind is constantly wandering. As soon as it does, bring it back to focus on the task at hand. The more you do this, the better you'll get at it, the more focused you'll be and the less likely you'll be to give back your gains. Most trading issues can be linked back to focusing on the wrong thing. Traders get overwhelmed thinking about various things—often money or immediate results. Many of us are taught that thinking about these things is good—it keeps us motivated. It is all just mental wheel-spinning though. This is a problem in all areas of life. As a trader, your only job is to research and test a plan as best you can. When you prove to yourself that you can trade it properly, focus solely on implementing that plan. In your off time you can think about anything you want, but when you sit down in front of your computer to trade, continually bring your mind back to implementing your plan precisely. Doing that is the only way to continually produce the income your plan is capable of producing.